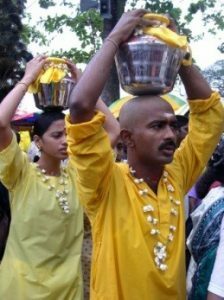 Photo: Malay man and woman in a religious festival. Singapore was one of the 14 states of Malaysia. It became part of Malaysia on 16 September 1963, Malaysia being a new political entity formed from the merger of the Federation of Malaya with North Borneo, Sarawak and Singapore. This marked the end of a 144-year period of British rule in Singapore, beginning with the founding of modern Singapore by Sir Stamford Raffles in 1819.The Malays compose the second most important ethnic group in the Southeast Asian island-country of Singapore after the Chinese. Reflecting its history and cultural diversity, Singapore has four official languages: English, Chinese, Malay, and Tamil. Dining is said to be Singapore’s national pastime, and the variety of food representing different ethnicities is seen by the government as a symbol of its multiculturalism. Singapore Malaysian represents 197 unrelated Malays residing in Singapore who were sampled in 2004 by the Center for Forensic Science, Health Sciences Authority in Singapore and the US FBI. Source publication: STR data for the 13 CODIS loci in Sinapore Malays, FSI, 2005, 148, p243-245. Singapore Malaysian represents 161 unrelated Malay Singapore Armed Forces personnel who were sampled in 2003 by National Laboratories, Singapore.